How I wish I could say that! Yes, really I mean it. I guess summer has already arrived in most parts of the world but here, it is still so cold. I can't really believe it is already May and still the temperature are in single digit! I am hoping May has something better in store for us. 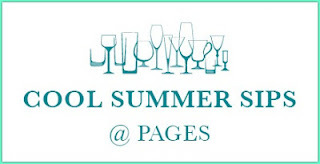 While I was thinking of a title for this event, I came up with this name- Cool Summer Sips (pun intended, it almost looks like we are going to have a cool summer). But, wait! That's not I am looking for. I love cool drinks, the ones that are perfect for summers - lemonade, spritzers, punch- all cold and icy like this Blueberry Lemonade or this Orange Spritzer or this Mint and Ginger Lemonade. Even icy cold Thandai is refreshing for the parched throat. How about some lip smacking cool shakes and smoothies! So, I want you to churn up some cool summery drinks so that I can at least have a virtual treat. 1. Prepare any cold drink that is perfect for summer. 2. Recipe has to be strict vegetarian. 4. Please send in your entries starting today, 1st May 2012 till on or before 30th June 2012. EXTENDED to 30th July 2012. 5. If you are on Facebook, please like my Facebook page You can find the widget on right column of this space. Non Bloggers are also welcome to send me any number of entries. Just mail me the recipe and the picture. While the linky tool is perfect for submitting your entries, I will however do a manual roundup of the event after the event is over. I somehow feel that those round ups have a personal touch. So, friends send in your summery sips entries! Thank you for stopping by! Cheers! Linked one more, Pineapple Juice With ginger..
Hi jyothi,linked my cooler,nice space of you.Happy joining with you.Do visit my space in your time. Lovely event, just linked an entry ! hi,Nice event. linked one entry. Fresh Orange juice.